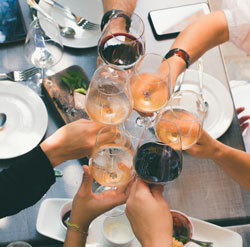 The South African Wine Society, now in its 20th year, is a non-profit wine tasting club focused on promoting knowledge about and access to South African wines in Canada. This is achieved by hosting informative wine tastings, relaxed social; dinners and providing members with an opportunity to savour wines which are readily available, as well as vintage collections from our carefully stocked cellar. Why not join the Society and embark on a journey discovering the wines and foods of remarkable South Africa and its leading wine producing regions? Learn about our Wine Cellar – a hidden member benefit. Each year SAWS arranges a dinner that allows its members to appreciate some of the finer points of the cuisine of our fellow Canadians. Toronto has a rich heritage. Its range of cultures and people provide a colourful quilt of neighbourhoods, often overlooked as we rush along. 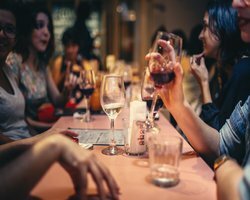 This event will be similar to some of our past initiatives and is intended to be dinner with a selection of wines and will provide the opportunity to interact with our friends before and during the meal. Rodízio is an all-you-can-eat style of Portuguese restaurant service. Traditionally, one pays a fixed price and the waiters bring various types of seafood and fish to each customer several times throughout the meal, until the customers signal that they have had enough. After the rosé wine reception, we will start with a fish soup followed by seafood and grilled fish rodizio accompanied by potatoes, rice and vegetables and four South African red wines. Grilled pineapple and coffee will follow. We will make every effort to accommodate your food allergies or special dietary needs if you let us know in advance. Fine wines, a great menu, great people. What’s not to like? CAUTION: Note that the event venue is on the 2nd floor and is not suited to those that have problems with climbing stairs. There is no elevator. Elegant and refreshingly crisp, aromas of cherry and citrus precede a creamier texture that builds on those flavours. Healthy medium cherry-red. Cranberry, raspberry, herbs and earth on the nose; aeration brings some darker cherry and forest floor notes. A juicy, leanish midweight, with good penetration to its red berry, herb and spice flavours. Nicely delineated, fresh pinot with brisk acidity and a light touch. Finishes with a fine dusting of dryish tannins and subtle length. In the foothills of Helderberg Mountain, it's traditional to add a splash of cinsault to cabernet sauvignon―and that's precisely what the winemaking team did here. The result is a plush, juicy wine with good structure, soft texture and plenty of blackcurrant and spice character. A rocky mineral note adds to the intrigue. Medium-bodied single varietal grenache offers easygoing versatility, fresh watermelon and apricot flavours and a wonderfully firm finish. A pretty nose of red and black berries plus subtle notes of fynbos, earth and spice. Light in body and with pure in fruit, a nice fresh acidity which doesn’t sit too much apart and fine tannins. An elegant wine. *We will make every effort to accommodate your food allergies or special dietary needs if requested. Lisbon By Night, 802A Dundas St. W., Toronto (at Palmerston). Street parking + off-street Green P between Claremont and Manning, north of Dundas. $5 after 6:00 pm. This event has a capacity limit. Once reached, members will be advised that no further registrations will be taken. Closing date: Your booking or cancellation must be received by Monday - April 15th, 2019. You will be contacted if we are unable to accept your booking. To find more information about the event, including registration, follow this link. Note: As a courtesy to other members, please refrain from wearing any scented products, including perfumes, colognes, after shaves or hand lotions. We hold 8 to 10 events per year made up of wine tastings and dinner with wine matching. Events are located in and around Toronto, Ontario, Canada. Excluding our annual Braii, events occur on weekdays, from 6:30 p m to 8:30 pm. Features eight South African wines. Allows you to try South African wines that are often not available at the provincially run liquor control board (LCBO). Is led by an industry expert - a winemaker, a wine writer or other professional. Is cost-friendly. As a non-profit organization, our aim is to allow you to try an extensive variety of high-quality wines at a reasonable price. Each year we offer two of special events. In February, we have the Gourmet Dinner Event on the evening of Ontario's Family Day holiday.. In June, we spend a lovely afternoon at Mario's farm just 45 minutes outside Toronto. This event exposes you to a traditional African Braii (BBQ) which includes Lamb on the spit, Chicken kebabs, boerewors (sausage), Stywe pap (if you haven't tried it, now is the time! ), biltong (a dried meat like jerky), and traditional South African milk tart. our membership coordinator at SAWS-membership@rogers.com.